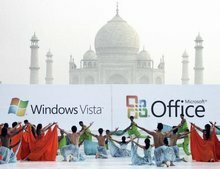 Six months after the release of the Microsoft Windows Vista operating system, Indian authorities have begun questioning Microsoft’s use of the Taj Mahal in the Windows Vista Wow launch event. On January 30, 2007, the Redmond company made Windows Vista available to no less than 70 countries around the world, including India. The Indian Supreme Court slapped notices on the Centre and the Archaeological Survey of India, asking for the details of the event. The SC order came on a petition against Microsoft for violation of environmental norms. Now, under the Ancient Monuments Act, public performance is banned near a heritage monument. Previous post: Global Warming : What does this mean ?